According to an article in the Daily Telegraph, Sarah Palin’s attacks on Barack Obama’s patriotism provoked a spike in death threats against the future president, Secret Service agents revealed during the final weeks of the campaign. The Republican vice presidential candidate attracted criticism for accusing Mr Obama of “palling around with terrorists”, citing his association with the sixties radical William Ayers. The attacks provoked a near lynch mob atmosphere at her rallies, with supporters yelling “terrorist” and “kill him” until the McCain campaign ordered her to tone down the rhetoric. But it has now emerged that her demagogic tone may have unintentionally encouraged white supremacists to go even further. The Secret Service warned the Obama family in mid October that they had seen a dramatic increase in the number of threats against the Democratic candidate, coinciding with Mrs Palin’s attacks. The revelations, contained in a Newsweek history of the campaign, are likely to further damage Mrs Palin’s credentials as a future presidential candidate. 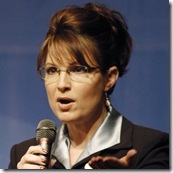 She is already a frontrunner, with Louisiana Governor Bobby Jindal, to take on Mr Obama in four years time. Irate John McCain aides, who blame Mrs Palin for losing the election, claim Mrs Palin took it upon herself to question Mr Obama’s patriotism, before the line of attack had been cleared by Mr McCain. Next Post: About that so-called "Ground Zero Mosque"